The latest MicroSmart FC6A Plus PLCs come with built-in BACnet/IP building automation protocol. The PLCs can be configured as BACnet Server. The controller comes with Subscribed COV, Unsubscribed COV and Foreign Device functions. The FC6A Plus PLCs when used as server connects to building automation BACnet Client controllers via Ethernet Port 1. The unit comes with 060 digital I/O, 511 analog I/O, Bluetooth communication, FTP Client/Server protocol. IDEC’s MicroSmart FC6A Plus PLCs can be configured as BACnet/IP Servers for connection to BACnet/IP Clients. IDEC Corporation, Sunnyvale, CA, August 7, 2018 — IDEC Corporation announces built-in support for the BACnet/IP building automation protocol by its family of MicroSmart FC6A Plus PLCs. BACnet stands for Building Automation and Control Networking Protocol, and it is the world’s leading protocol for networking HVAC, lighting, security and other systems commonly found in commercial and industrial buildings. This open protocol has been standardized under the ANSI/ASHRAE 135-2012 specification for interoperability among systems built by different manufacturers. 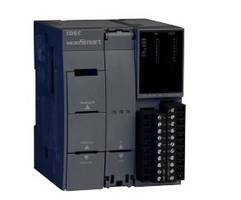 Built-in support for the latest version of BACnet, BACnet/IP and its B-ASC profile allows equipment and systems using IDEC’s MicroSmart FC6A Plus family of PLCs to act as a BACnet Server and thus easily connect via the PLC’s Ethernet Port 1 to other building automation BACnet Client controllers and systems for data sharing, trending, scheduling, alarm and event management, device and network management, and other functions. Supported PLC object types analog input, analog output, analog value, binary input, binary output, binary value and device. Up to 256 objects can be simultaneously supported, with up to 64 bytes of characters for each. Support is provided for Subscribed COV (change of value), Unsubscribed COV and Foreign Device functions. With the Subscribed COV function, the BACnet Client sends a subscribe request, and the BACnet Server, such as an IDEC MicroSmart FC6A Plus PLC, sends “Present Value” and “Status Flags” when these parameters change. The Unsubscribed (or Unsolicited) COV function is similar, but in this case the BACnet Client does not need to send a subscribe request to the BACnet Server because it sends the designated data to the Client whenever the data it changes. Added objects are listed on a tree, and the properties for each object are configured by entering data into a grid. Typical object properties or settings include property name, device control, initial value, device assignment and others. MicroSmart FC6A Plus PLCs already exceed the competition with premium features including 2060 digital I/O, 511 analog I/O, Bluetooth communication, FTP Client/Server protocol, SD memory for data logging, dual Ethernet ports and the WindEDIT Lite App for iOS and Android. Now, with the introduction of support for the BACnet/IP protocol, users can expect even more capabilities, all with no extra hardware required or added cost. With just a simple firmware upgrade in the latest version of WindLDR programming software, configuring BACnet/IP is simple and intuitive.